The day started with yet more midges and with another trip to the cafe – it is a really nice cafe. 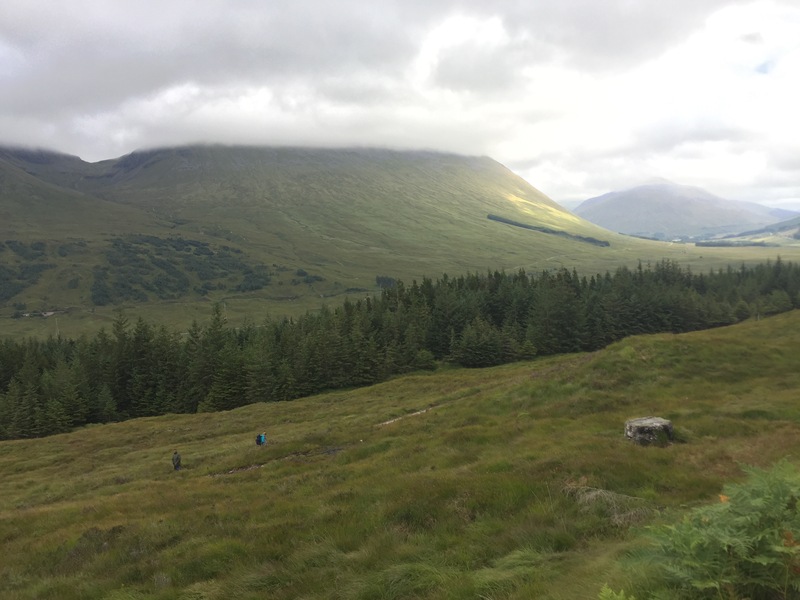 If you ever find yourself in Tyndrum I recommend it, I managed 3 trips in 18 hours! I had the full Scottish breakfast and was stuffed by the time we came to leave, but not enough to put me off buying a slice of cake to have later. Off we went; myself, Akshay, Sophie, Rawnie and of course Dougal. The route out of Tyndrum picked up the line of the main road and the railway line which although the views are lovely, tend to distract the eyes and ears a little. Once we turned away from them it was much easier to appreciate the scenery. Other than that the day was uneventful, so I’ll let the photos do the talking. We arrived at the Inveroran Hotel where there is a ‘wild camping’ spot a few hundred metres down the road, next to the river. I say ‘wild camping’ in inverted commas because there were about a dozen other tents either side of the road and the hotel are very accustomed to people using their facilities, so it more or less felt like a regular campsite but with the facilities all the way at the opposite end of the site. We headed to the bar for some drinks and a few rounds of Uno. Akshay and Sophie wanted to cover more ground the following day so we agreed on an 8am departure time. An already slightly damp dog before we’d even left! We didn’t leave at 8 o’clock as planned. The forecast for the day was not good and I had ummed and arred about taking a rest day, so was slow getting ready. I also noticed a distinct lack of noise coming from Rawnie’s nearby tent and when I knocked on her door at 8, she was still fast asleep. We agreed to let Akshay and Sophie go ahead and we’d leave later. After tea and coffee at the hotel, and once Rawnie had bandaged up her poor blistered feet we set off in the rain to cross Rannoch Moor. It felt like a slog up the gradual hillside in the wind and rain, and the first 3km seemed to take forever – the delights of the moor. There was a break in the cloud just as we sat down for some lunch which was perfect. 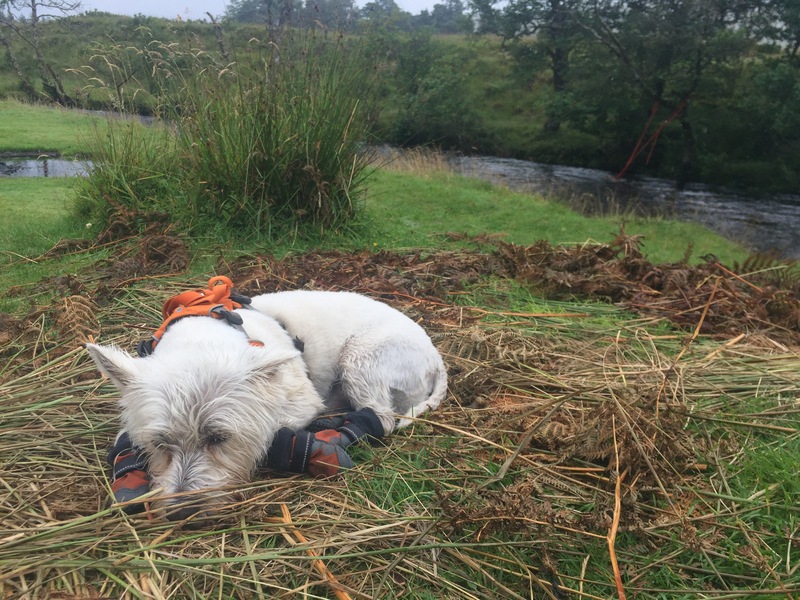 Dougal was looking less than impressed at being taken out in this weather, even though he had his little booties on, so Rawnie wrapped him in a jacket. We continued around the outskirts of the moor and came around the corner towards the Glen Coe Ski Resort. For the last few hundred metres it really chucked it down. We were due to head to the next place on the route which had camping and a bunkhouse (and where Rawnie’s bags were waiting for her), but when we saw that there was one cabin left, we grabbed it. Just in time too, the next group asked for a cabin only to be told that the last one had just gone. We settled in, hung everything to dry and then Rawnie found a local taxi driver who was willing to drive out and transfer her bag for just £5 – problem solved. We all enjoyed the solidity of the cabin as the winds picked up and the rain was on again, off again all night. Dougal also looked much happier and took to me so much that he slept at my feet! “Traitor”; Rawnie muttered at him. The weather was vastly better and we strode off towards Kingshouse where we stopped for a drink and snack. I was quite glad we hadn’t stayed there as it would’ve been a very different night compared to our cosy cabin. Then we set off along the valley (again shared with a busy road) and eventually turned up towards a section of the path called ‘The Devil’s Staircase’. Such a name conjures up images of a relentless set of giant rocky stairs, fortunately it doesn’t live up to its name. It’s merely a few switchbacks at the top of the ascent and don’t appear to give anyone much trouble. The views from the top are well worth it, and it’s the highest point of the WHW. 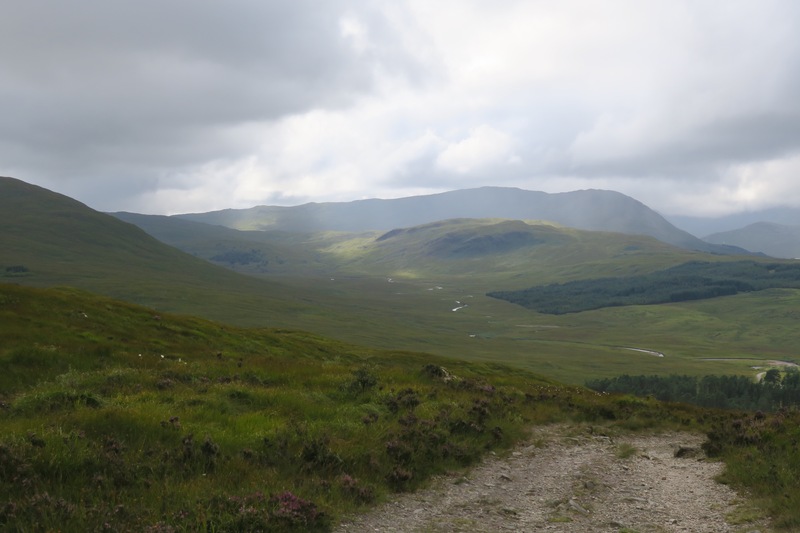 Then begins the long descent to Kinlochleven. Rawnie and I agreed that going up is much easier than going down and we both just trudged on. 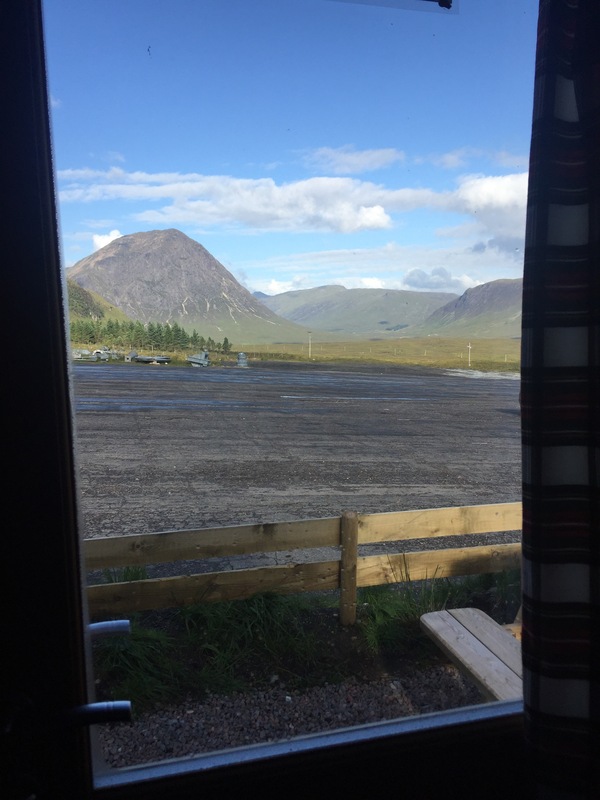 The campsite at Kinlochleven was nice enough but we didn’t hang around too long, instead we headed to the Tailrace Inn for some proper sustenance. After burgers, chips and beer all round we were ready for bed. 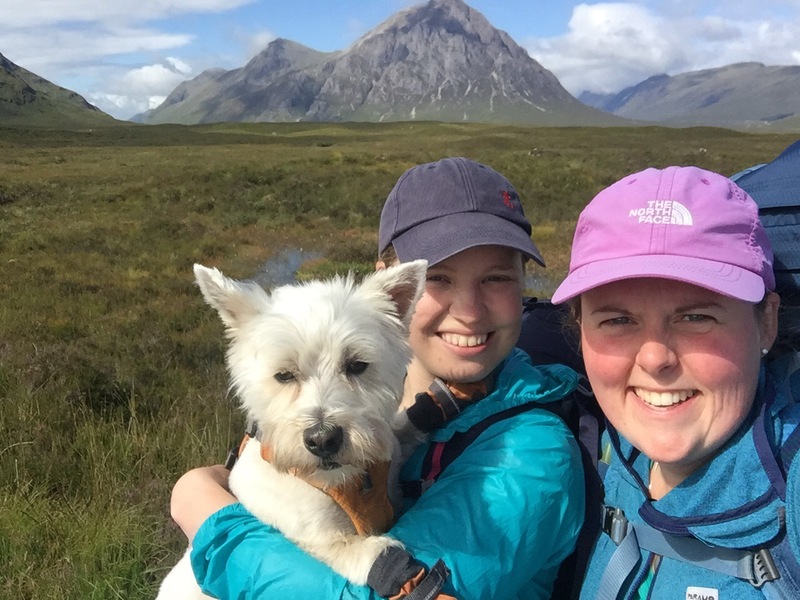 Today marks the last day of the WHW and the last day of Rawnie’s trip, I’m staggered she made it this far, but having got to know her over the past couple of days, a few blisters were not going to stop her. She’s tough. It might not have been the end of Dougal’s trip though, if I could just find a way to distract Rawnie I could dog-knap him and enjoy the company of his wagging tail all the way to John O’Groats. The air was thick with midges at the campsite and I had managed to sleep through my alarm. Both of these factors led me to pack up in record timing. 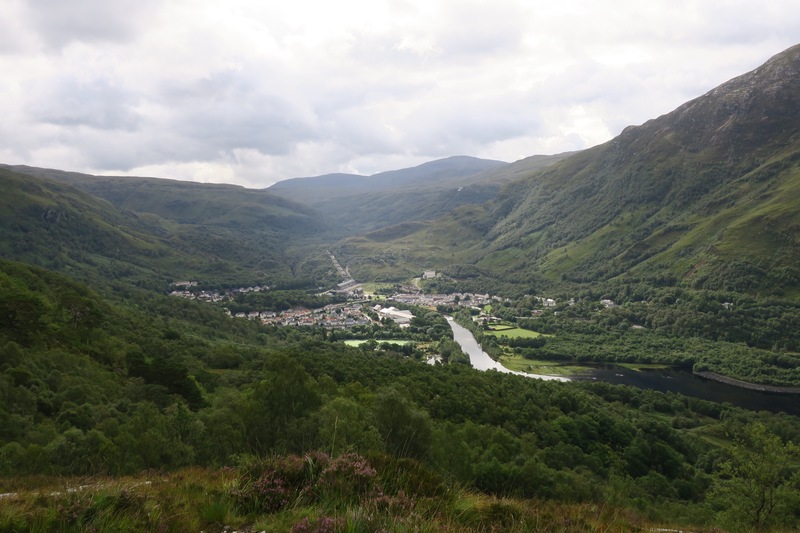 It was a stiff climb out of Kinlochleven through the forest and first thing in the morning too. We eventually got to the plateau and continued up the valley. There were lots more people out and about today, I think quite a few Fort William day trippers come and walk the last section. 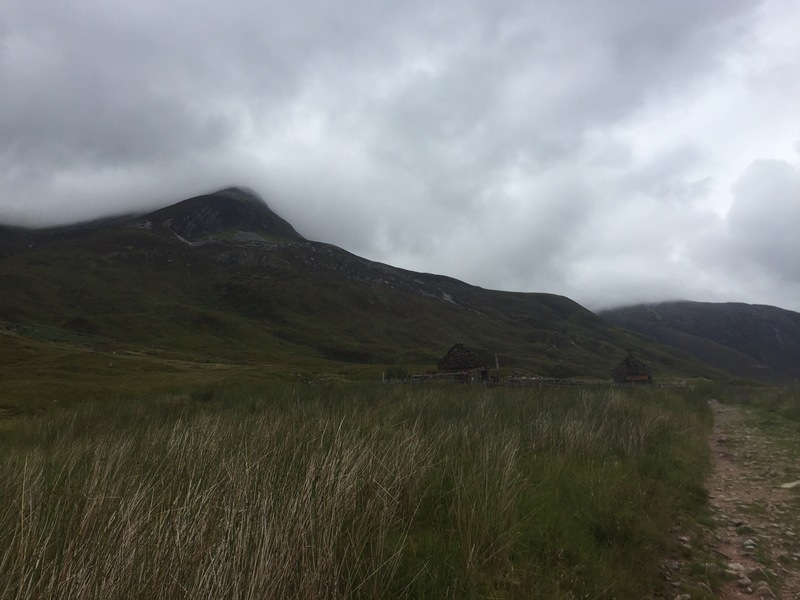 Eventually we reached the bealach and Ben Nevis came into view – well what we could see of it – the summit was shrouded in cloud. Then it was time for another long descent through forest to Glen Nevis. 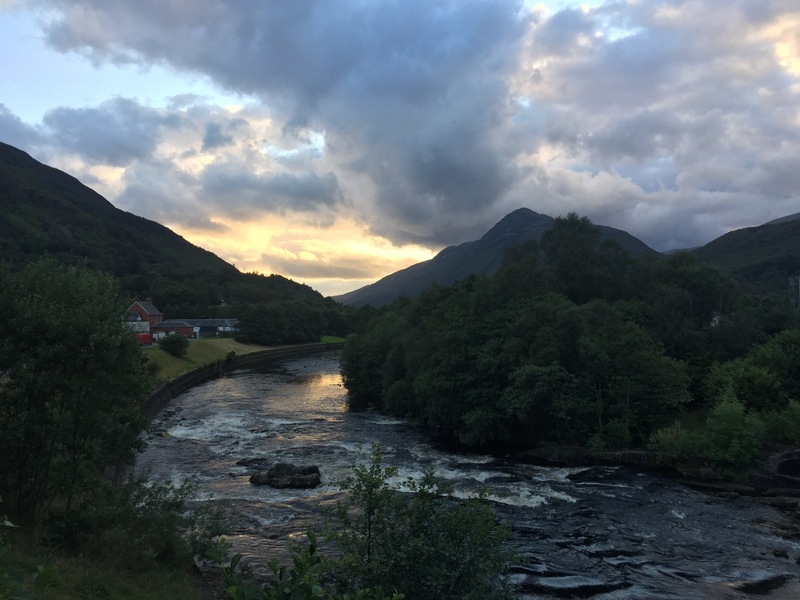 It seemed to go on forever but we eventually hit the valley floor and although I was staying at the hostel there, I decided to accompany Rawnie to the end of the WHW which is in the centre of Fort William at the statue of the man rubbing his sore feet. We said a quick goodbye as Rawnie had a train to catch, and suddenly I was back to being on my tod again, having had company on the trail for a whole week. I did the only thing that made sense – hit the pub. I was mentally and physically drained, the week had gone by in a flash and I hadn’t had any time to consider the next stage and what I needed to get organised. I’d indulged in the infrastructure that surrounds the WHW knowing that facilities and services would be limited to 2 villages in the last 250mile leg so needed to get prepared for that. 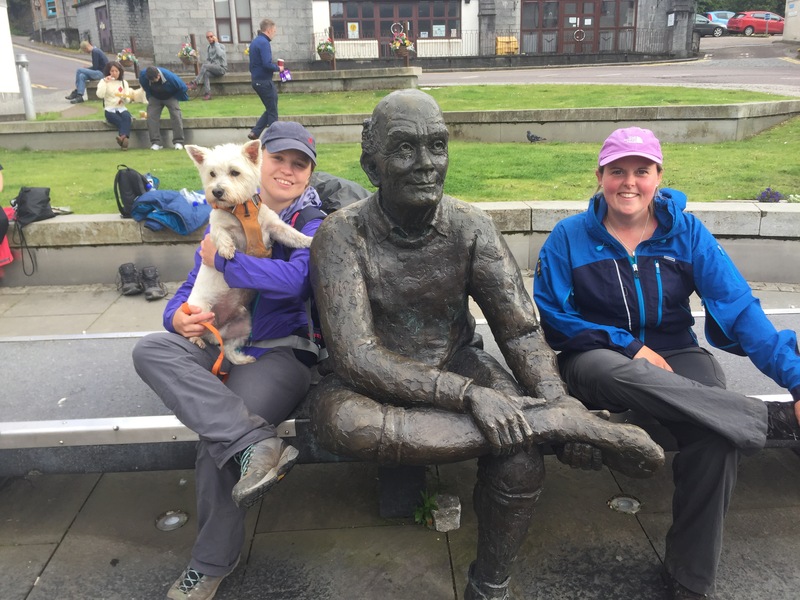 It was always in the plan to stop for a few days in Fort William – as afterwards is where the route gets a bit more serious – so that is what I did.